We want UB to be your home away from home, and we have just the place for you. From traditional dormitory-style housing to on-campus apartment villages, you will find a wide variety of affordable living arrangements that meet your needs. 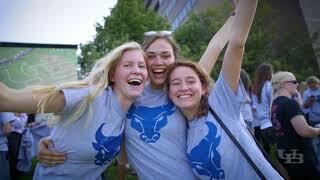 DORM LIFE: UB has 13 residence halls, including two on the South Campus. Each living unit is staffed with a resident advisor to provide supervision and assist you with any questions you may have. THE PERKS OF BEING ON CAMPUS: Live where you study and enjoy being close to everything on campus, including academic buildings, dining centers, recreation and laundry facilities, and more. MEET NEW PEOPLE: No matter which housing option you choose, you’ll meet people from around the globe while making new friends. SOPHISTICATED LIVING JUST FOR SOPHOMORES: Our newest residence hall is a unique campus living experience that combines dorms with multipurpose spaces for workshops and social gatherings, a business center, café, fireplace lounge and office space for faculty members, all with state-of-the-art technology. APARTMENT-STYLE LIVING: Our three apartment-style villages—Flint, Hadley and South Lake—offer the convenience of a short walk to campus buildings and athletic events with amenities like air-conditioning, university security, campus shuttles and on-site laundry facilities. Housing choices are based on seniority. Most first year students who choose to live on campus will be placed in one of the Residence Halls. In subsequent years, you will also have the option of living in one of our Apartment Complexes. You’ll find lots of great places to eat at UB. The diversity of our campus population is reflected in the wide range of dining options, making it easy to find something to eat no matter what you are in the mood for—pizza, Korean, Mediterranean, vegan, vegetarian and more. CROSSROADS CULINARY CENTER: At C3, you can choose from a variety of international cuisines and watch as your entrée is prepared fresh in front of you. It was named best residential dining concept among large universities. YOUR COFFEE AWAITS: A fresh-brewed cup of coffee is never far away when you’re on campus. We have Starbucks, plus Western New York favorite and Canada-based Tim Hortons, along with Au Bon Pain and even our own coffeehouse called Perks. UB COMMONS: In addition to our three dining centers, you’ll find dozens of other food and beverage locations around campus and in our Commons shopping and dining court, with offerings ranging from pizza, sushi and fresh-made salads, to an Indian buffet. 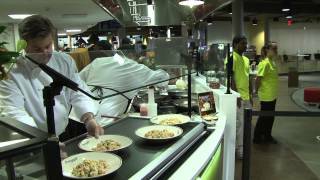 UB boasts one of the best dining facilities in the United States. Our Crossroads Culinary Center was recognized with the prestigious Loyal E. Horton Dining Gold Award from the National Association of College and University Food Services.